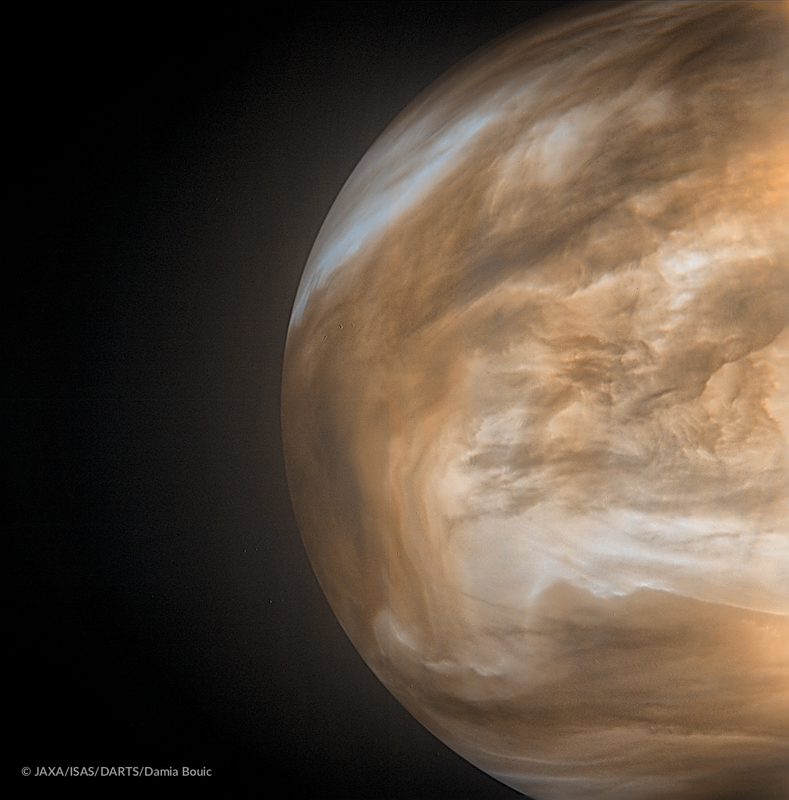 Here are some fantastic new images of Venus as imaged in infrared by the Japan Aerospace Exploration Agency (JAXA) Akatsuki Venus Climate Orbiter (also known as PLANET-C). 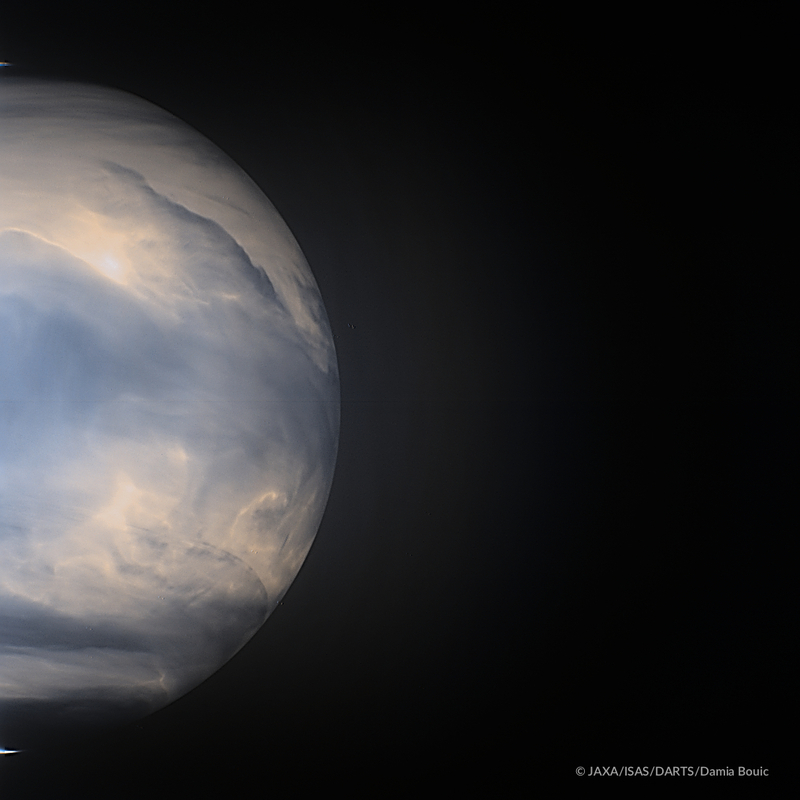 Venus, the Roman goddess of love and beauty and Earth’s sister planet. At 7,521 mi. (12,104 km) in diameter, it’s just under 400 mi. (644 km) smaller than Earth but the similarities end there. At first glance, it appears that Venus’s axial tilt is only about 2 degrees which is much less than Earth’s 23.4 degrees but when you look more closely we discover that Venus; for reasons that are still unknown, rotates retrograde or backwards from the other planets of the solar system. Because of this backward rotation, its axial tilt is actually a whopping 177.4 degrees. 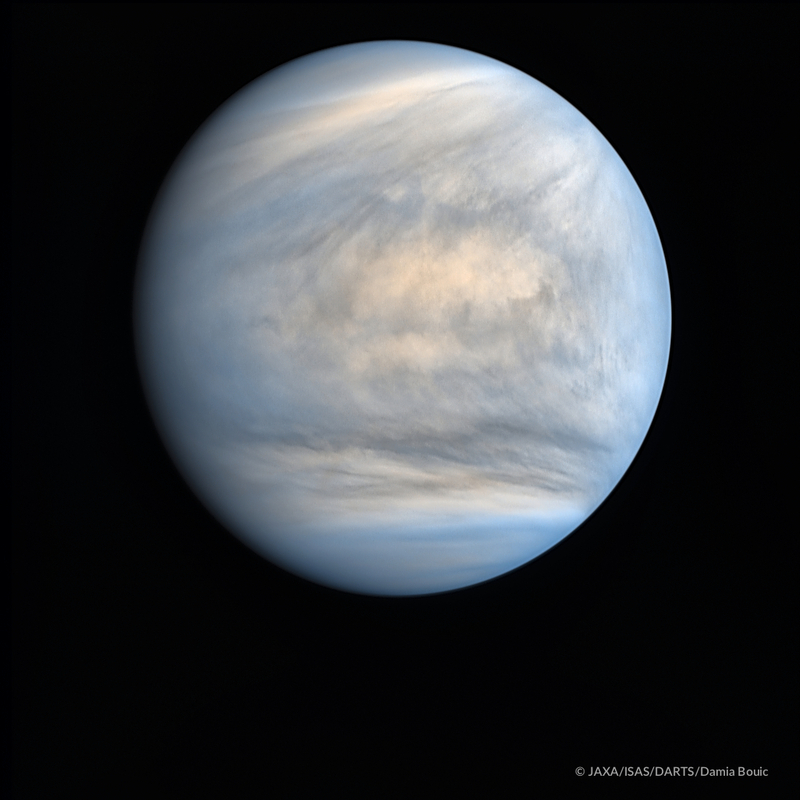 Venus also orbits the Sun every 224.7 Earth days and a day is 243 Earth days which means a day is longer than a year on Venus. In fact, it has the longest day of any planet in the solar system. 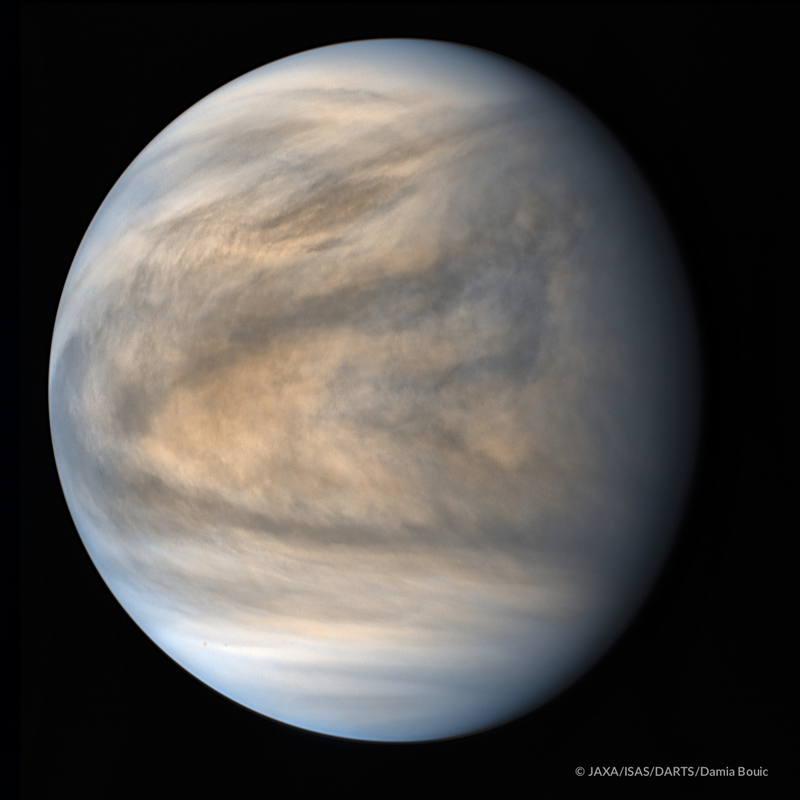 You wouldn’t find many Earthlike similarities if you made the mistake of landing on Venus either as average surface temperature is a balmy 864 degrees F (462 C and 735 K) so you may need to bring some air conditioning to your new 96% carbon dioxide environment. 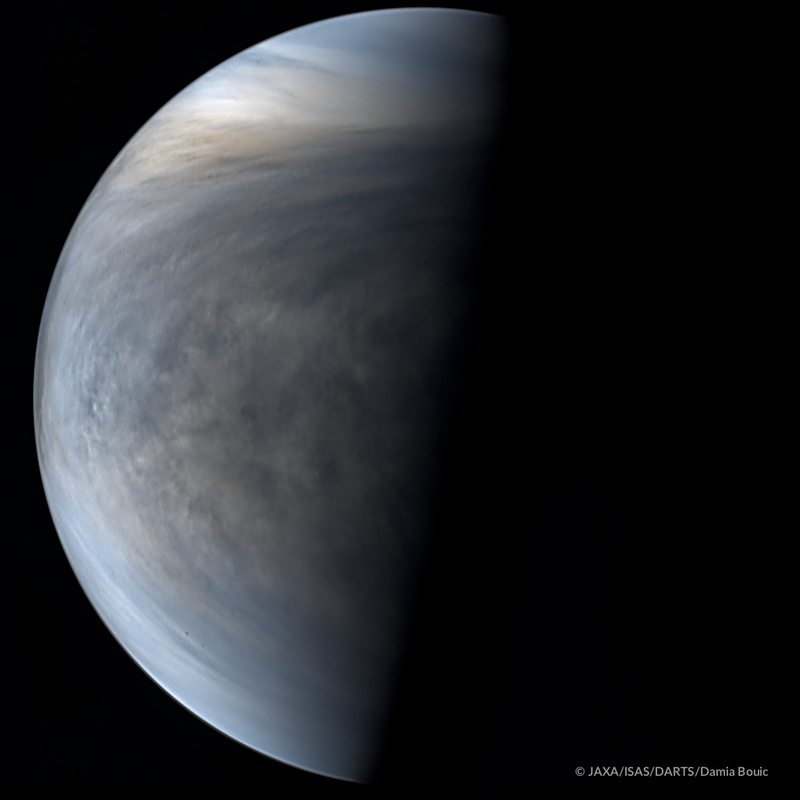 Venus’s surface pressure is also impossibly Hellish. At 92 times that of Earth, surface pressure is the equivalent of being 3,000 ft. (900 m) under the ocean. 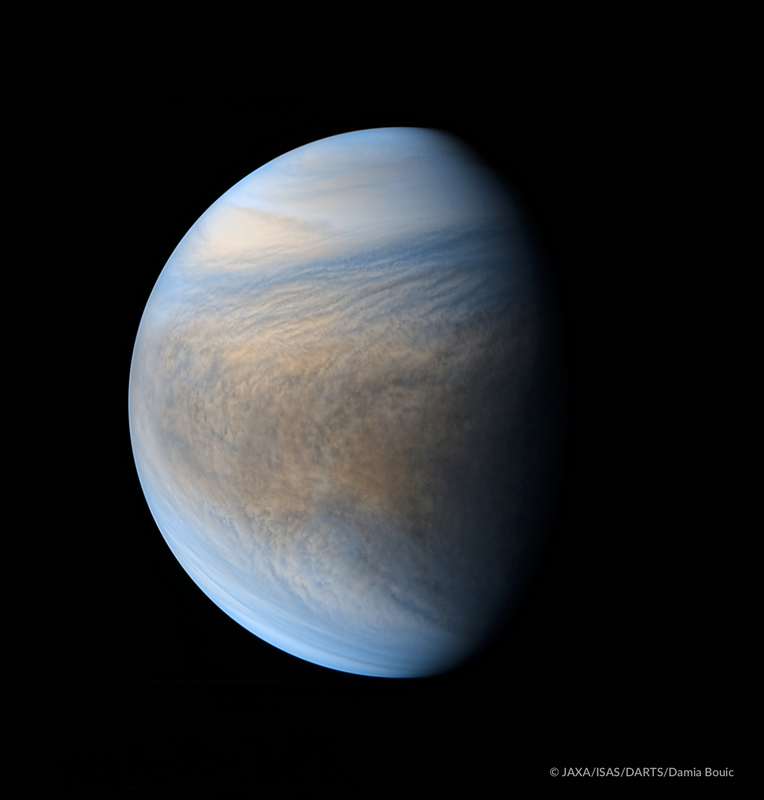 Venus also has no moon, no magnetic field and no plate tectonics. The lack of tectonics has the greatest impact on the planet as on Earth, tectonics helps to recycle carbon because it’s subducted back into the mantle. Because Venus’s surface appears to be relatively flat (highest to lowest points are only a difference of 8 mi. or 13 km) and similar in age everywhere we look, it’s believed that the lack of tectonics also allows pressure to build within the planet until it can withstand no more and the planet is entirely resurfaced in one major event. The lack of impact craters may be supporting evidence for this as well. 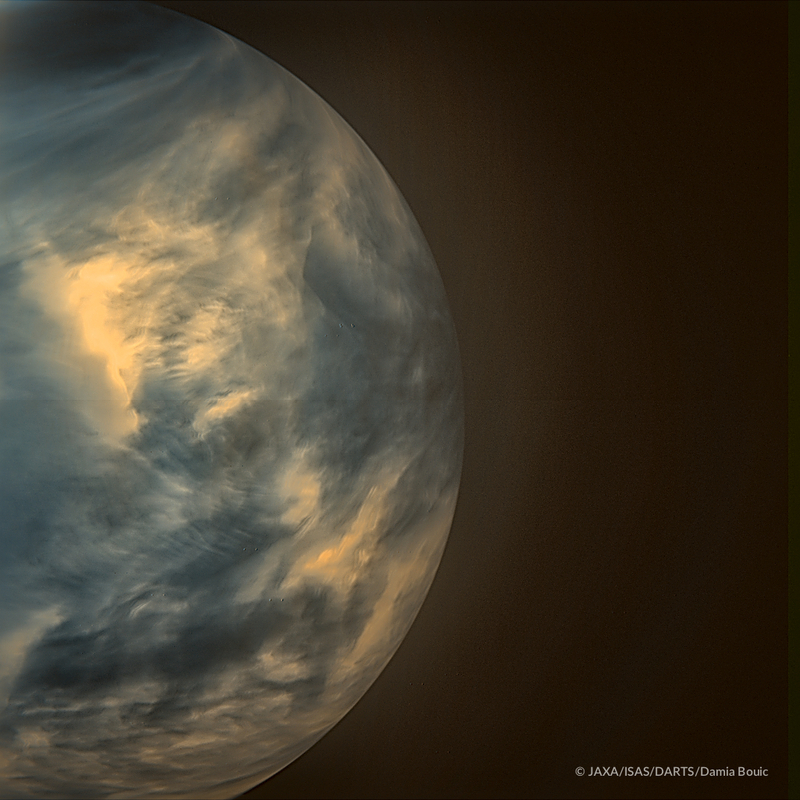 What about Venus as we see it from here on Earth? Because it, like Mercury are inferior planets (orbit inside of Earth’s), it is sometimes seen after sunset in the West as the evening star and in the East before sunrise as the morning star. The Greeks called the morning star Phosphoros; the Bringer of Light and the evening star Hesperos; the Star of the Evening. 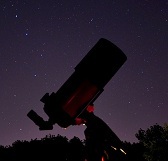 Image | This entry was posted in Astronomy (Learning), Images, News, Solar System and tagged Akatsuki, Damia Bouic, DanSpace77, Japan Aerospace Exploration Agency, JAXA, Planet, Planetary Society, Solar System, Venus. Bookmark the permalink.